Pressing and drying beautiful flowers from my gardens used to be somewhat of a tedious and long process for me. Although it is a relatively simple technique, I just lack the patience to wait for the beautiful blooms to be completely dry before I can use them in a project. Often I would collect some flowers in order to create some craft project, I would pick them and press them in a handmade press (an old telephone directory topped with a brick!) and then forget about the project as it took several days, sometimes weeks for the flowers to be completely dry. Not anymore because I am the proud owner of the Microfleur®. As a Designer for the Arnold Grummer Paper Making blog I get to work and play with some really fun tools and products, including the Microfleur® (which can be purchased through the AG store here). The Regular Microfleur® is a Microwave Flower Press which enables you to press and dry flowers in minutes in your microwave oven. In my case it takes merely seconds! What a bonus for this impatient crafter. Note that there is a larger model available. The kit consists of 2 platens (tough microwave resistant plastic type plates with perforations), 2 clips or 4 clips for the Max size model, 2 pads, and 2 sheets. To load the Microfleur® you just place one platen ribbed side down on a surface, place one pad on top and then one piece of fabric on top of the pad. Next, place the flowers and leaves to be pressed on top of the fabric, making sure they sit as flat as possible and do not overlap each other. Carefully place the second sheet of fabric over the layer of plants, and then place the pad over the top. Cover this with the second platen making sure the ribbed side is facing outwards. Apply some pressure while adding the clips to hold this "sandwich" together. Be careful not to overfill and apply too much pressure when installing the clips, so as not to cause any damage. 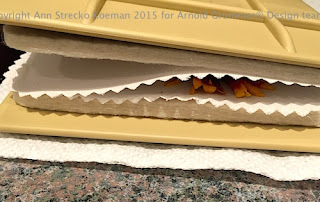 Next, use the microwave oven to press and dry. Now, note that each microwave oven has different powers and will require different amounts of time. Also, the pressing and drying time is affected by what type of flower you are pressing and the amount of liquid that is retained in each plant. This will have to be done in trials. It is best to use the microwave oven in short bursts. In my case as my oven is quite powerful it took very little time, between 10 and 30 seconds. Also, be careful when handling the press as there can be a surprising amount of heat generated by such a small device! 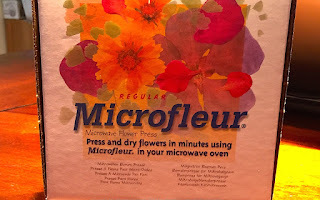 I truly enjoy using my new Regular Microfleur® Microwave Flower Press and hope to invest in the larger model soon. It will be the best way that I know how to preserve a little bit of our very short Summers here by drying some flowers and admiring them during those long Winter months. Thank you for stopping by, enjoy the rest of Summer and keep Crafting!